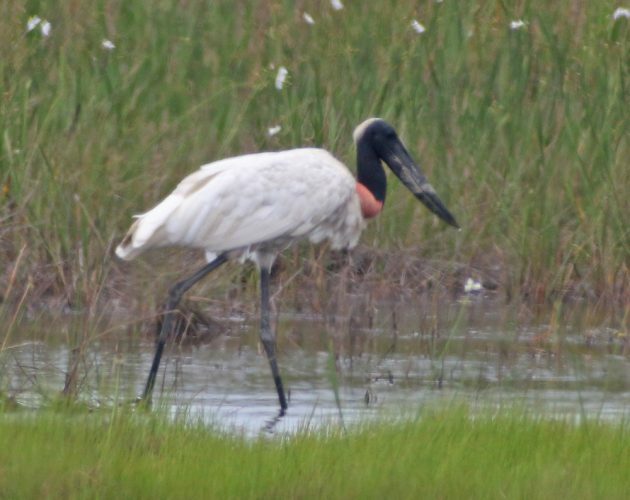 While in Belize for my family vacation one of the birds I most wanted to see was a Jabiru. The massive, shoe-billed stork is an amazing bird to see even in the pages of a field guide; to see one in the field, for real, would be unbelievably awesome. My best chance to see one would be during the three days we planned to spend in Hopkins, on the Caribbean coast of Belize. 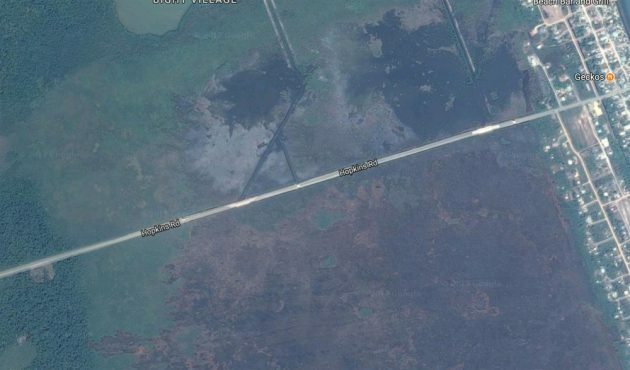 And the best location to see one would be in the marshy lands just west of Belize, through which Hopkins Road, the road that leads you to Hopkins from the Southern Highway, runs. 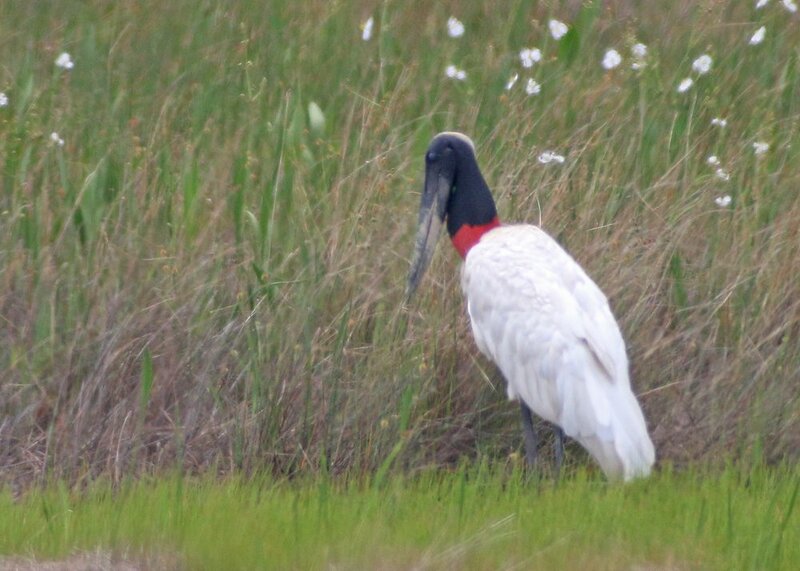 When we transferred from Sleeping Giant Rainforest Lodge to Hopkins I convinced the driver to stop a couple of times while we traversed the marshes so I could scan for Jabiru. There were lots of herons and egrets and even a surprising Least Bittern that took flight, but no giant storks with a red patch on the chest. I knew I had to make another attempt, but when? And how? From where we were staying it was a good two miles each way and I didn’t relish the idea of that long of a walk in the tropical heat and humidity. I considered asking around about a taxi but then I realized the perfect solution: renting a golf cart! Daisy and Desi were game for this little adventure, especially with the added inducement of exploring Hopkins a bit on the way back from the marsh. So on our last full day in Belize we rented a cart and away we went! I quickly learned that the golf cart we rented wasn’t like the electrical ones I had driven before. This cart was gas-powered and slow to speed up. Not only that but the road through Hopkins isn’t the smoothest of rides. Desi sat up front with me while Daisy sat on the back-facing, rear seat because she was less likely to fall off than Desi and so she could warn me of faster vehicles coming up behind us. It was a fun drive and before long we reached the paved Hopkins Road. Now, this road is essentially the only way in to and out of Hopkins from the rest of the country, or at least the only road that is used by anything lacking four-wheel drive. That means that it is pretty heavily trafficked by a wide variety of vehicles that are larger than a golf cart, including dump trucks and buses. That might not sound scary but when your whole family is tooling along in a golf cart and a giant dump truck comes roaring up behind you and overtakes it is a bit unsettling. Fortunately, there are wide shoulders on Hopkins Road so there was plenty of room to pull over and scan with my scope. The marsh west of Hopkins, adapted from Google Maps. Scan I did. Roseate Spoonbills. Little Blue Herons, lots of which were showing the patchwork plumage of those transitioning from juvenile to adult. Snowy Egrets. Great Egrets. Yellow-crowned Night-Herons. Of course, Black Vultures and Turkey Vultures soared in the sky and off towards the coast there were Magnificent Frigatebirds doing the same. After several stops I had scanned the whole marsh and Desi, after initially being pretty excited about the spoonbills, was getting kind of bored with hanging out watching me peer through my scope. We turned around, heading back towards town, with me planning to stop at the spot that had the most birds on the way out for another scan, though I had pretty much already acknowledged defeat. I quickly glanced over my left shoulder and saw a dark-and-light, long-legged bird flying towards us in the split second I felt safe taking my eyes from the road. “Looks like another Little Blue Heron,” I said. But come on! Jabiru! And it landed right in the spot I wanted to stop on the way back, near the spoonbills and a bunch of other wading birds. So, you know, I would have found it eventually even if Daisy hadn’t spotted it and essentially identified it. With her bare eyes. At a distance. From a moving golf cart. As a non-birder. Yeah, I’m never going to live this one down. 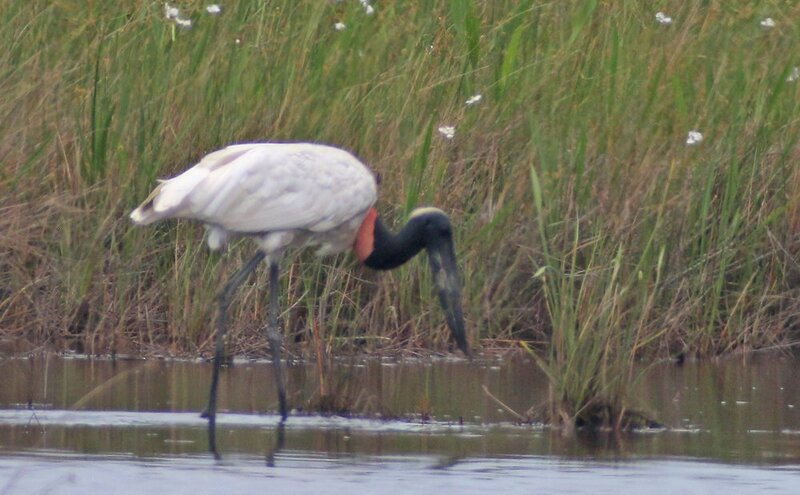 I did enjoy watching and digiscoping the Jabiru for awhile though. Daisy was smart enough to plan ahead and have some horribly sugary snacks to keep Desi busy for the fifteen minutes we spent with the awesome bird. First we watched it sit for a bit as it preened. Then it went for a walk through the marsh, at one point catching and eating something. 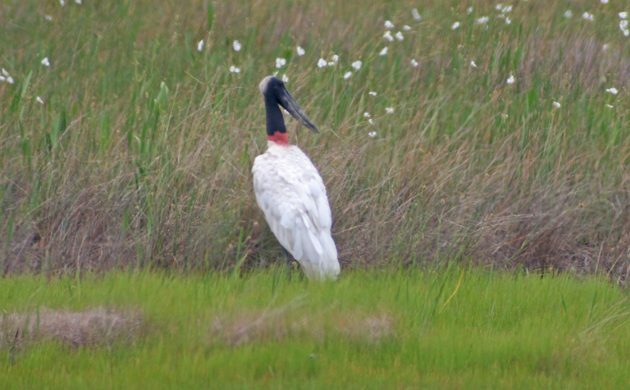 Without the direct comparison its hard to tell just how big a Jabiru is. 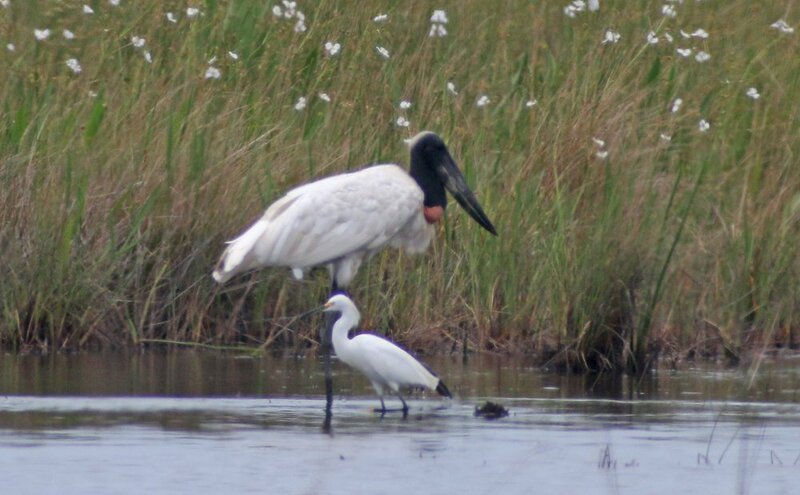 Here it dwarfs a Snowy Egret. Watching a Jabiru was very exciting for me but the family soon had enough. Especially once Desi’s sugar-high kicked in. Congrats on an awesome lifer with a great story to go with it! That’s such a wonderful story about seeing your first life Jabiru! And I’ll remember your advice about renting a golf cart to go birding next time my husband seems less than eager to accompany me on long hikes to catch a glimpse of a rare bird. It’s great because not only is it a fun way to get around but it is open air so you can still hear birds! Cool story. Never underestimate the powers of the non-birder. And I am surprised that one can drive Golf carts off golf courses, both legally and practically! They seem to be popular on small islands and isolated (tourism-based) communities in the tropics. I like them! Yeah, I have to admit, the golf cart idea is genius! Quiet, simple, definitely have to keep that in mind. oh, yeah, great bird find too! Daisy is a spotter! hahaha, good going, ‘non-birder’!